A memorial for nine fallen soldiers of the Islamic Army of the Caucasus that took part in defending the Azerbaijani population from Bolshevik and Armenian incursions in 1918 has been erected in Baku, Azerbaijan. 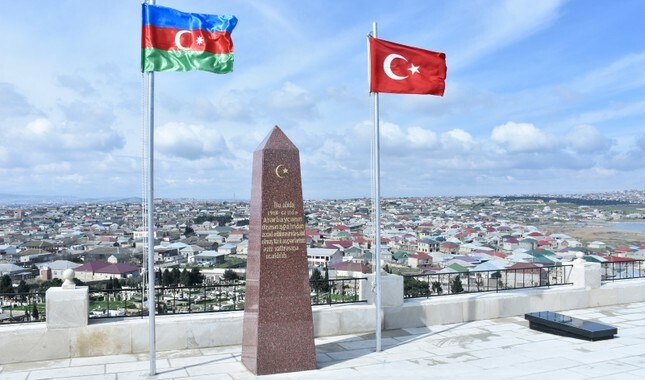 The tombs of the soldiers, which have been looked after by locals for centuries in the town of Digah near Baku, were repaired and transformed into a monument bearing both Turkish and Azerbaijani flags. Turkey's Ambassador to Baku Erkan Özoral paid a courtesy visit to Absheron Gov. Irade Gulmemmedova to thank the government for its fidelity to the fallen Turkish soldiers. "We consider honoring the memory of Turkish soldiers that defended Azerbaijani soil as a debt," Gulmemmedova said during the visit. Özoral also noted that the largest number of fallen soldiers' cemeteries outside Turkey are located in Azerbaijan. The Islamic Army of the Caucasus was established by the order of the Ottoman Minister of War Enver Pasha on July 1918. The military unit included 12,000 soldiers with the addition of Azerbaijani militias. The army liberated the capital city of Baku from a British military mission led by British Gen. Lionel Dunsterville on Sept. 15, 1918. It also retook other cities during the conflict, which cost the lives of 1,130 of its soldiers. Today, dozens of fallen soldier tombs and cemeteries are located across Azerbaijan.